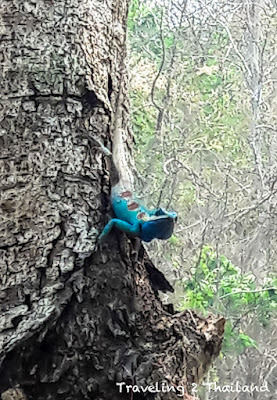 While walking at Wang Sila Leang in Pua I (actually my wife) saw this creature sitting on a tree. Why such a strong colour? I was told that if they notice that they can not hide by adapting to the background colour then they will show a colour that hopefully scares you. What a beautiful creature of nature! For more information about the beautiful Nan province in North Thailand see Destination Travel Guide Nan, Thailand.